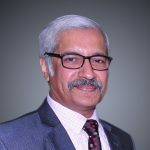 Dr. Piyush Gupta has 30+ years of experience in Information & Communication Technology, E-Governance Strategy, Implementation, Management and Operations in Government and Private sector. Dr. Piyush had led Capacity Building & Knowledge Management initiatives involving developing innovative learning approaches, strategies, collaborations, business growth including Consulting assignment across Central Government of India and various States in India for over 10 years. Dr. Piyush headed Capacity Building & Knowledge Management as Associate Vice President during the years 2004 to 2017, for National Institute for Smart Government (NISG) which is established in collaboration between Government of India, AP state government and NASSCOM. He has been instrumental in strategizing various capacity building initiatives under the National E-Governance Plan along with the Department of Electronics and IT, Government of India. He is a key architect for the E-Governance Leadership workshops for political leaders across the country and, of a full-time one-year E-Governance course, started in collaboration with management institutes like IIM-Indore and TAPMI Manipal. He was Honored by the World Education Congress, as “Top 50 Most Impactful Knowledge Management Professionals” in 2016 and “Top 50 Most influential Knowledge Management Professionals” in the year 2015 at the Global Knowledge Management Congress & Awards.